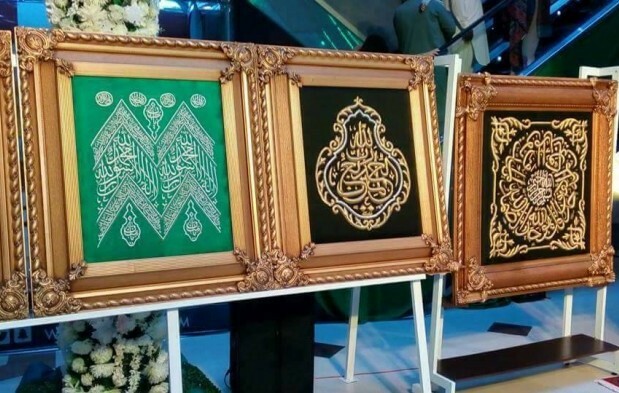 The Saudi Embassy in Pakistan has organized a spectacular display of ‘Holy relics’, ‘Ghilaf-e-Kaaba’, ‘Parda Baab-ul-Kaaba’ and other artifacts. This is the first time that Ghilaf-e-Kaaba has been put on display for the people of Pakistan who have not got a chance to witness the Holy places.The exhibition is open at Islamabad’s Centaurus Mall. The exhibition is open at Islamabad’s Centaurus Mall where a large number of visitors have been observed. The Centaurus shopping mall is claiming to be the pioneer of hosting Pakistan’s first ever venture of Ghilaf-e-Kaaba and other Holy Relics. The exclusive display of religious artifacts started from 4th, Oct 2017 and will continue till 15th of October . Many prominent personalities including Legendary test cricketer Younas Khan, Ex Prime Minister AJK Sardar Attique Ahmed Khan and Senator Rehman Malik paid visit to Ghilaf-e-Kaaba exhibition The Centaurus Mall. 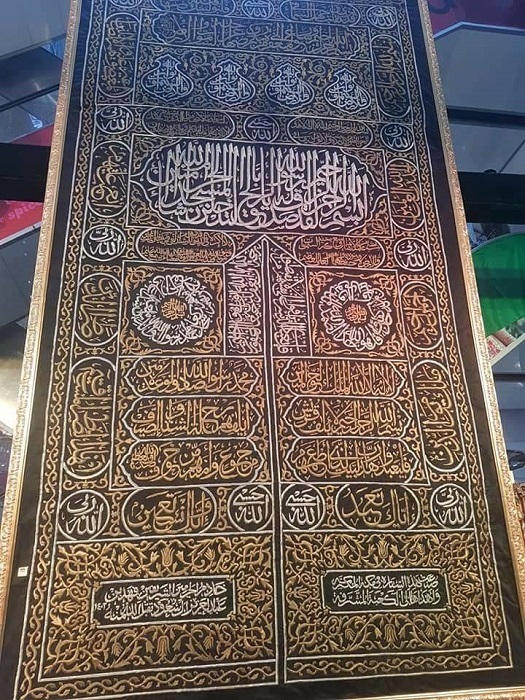 During the exhibition, the Parda Baab-ul-Kaaba being displayed is 5.1 metres long and three metres wide, illuminated with gold-plated embossed calligraphy of verses from Holy Quran. While, 20 metres long and six metres wide Ghilaf-e-Kaaba is also being showcased in the exhibition, besides many other artefacts. The inauguration ceremony was graced by chairman Pakistan Muslim League Nawaz Senator Raja Zafarul Haq, Saudi deputy ambassador Habibullah Obaid al Bokhari, President Sardar Group of Companies Sardar Tanveer Ilyas Khan and others attended the inaugural ceremony. Parda Bab-ul-Kaaba’ from the Kingdom of Saudi Arab displayed for the people of Pakistan. The ambassador also handed over a key of Khanna Kaaba to the Raja Zafarul Haq as a mark of respect and love towards the people of Pakistan. The Sardar Tanveer Ilyas Khan, President Sardar group of company, as a goodwill gesture offered free exhibition space in The Centaurus Mall to Saudi Government to display a respect for the sacred religious artifacts. Raja Zafar ul haq during his talks thanked the Saudi king for his goodwill gesture and said that it is a matter of honor for the people of Pakistan. He hoped that such exhibitions will promote friendly ties between the two countries at the people-to-people level. The Saudi deputy ambassador Habibullah Obaid al Bokhari said the Saudi Kingdom has decided to hold the event mainly to strengthen between Saudi Arabia and other Muslim countries. The ambassador further added that the landmark exhibition on the Centaurus Mall will present the guests a chance to witness the sacred door and Ghilaaf-e-Kaaba.